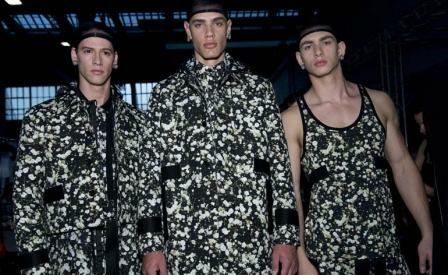 A sweeping theme of deconstructing nostalgia could be applied to Riccardo Tisci's spring Givenchy show - one that he backed with a Reims Cessna F172E aeroplane, which Dutch artist Paul Veroude dismantled and suspended, piece-by-piece, above the ground. That artwork is called 'Exploded Plane', and Tisci's collection could follow as 'Exploded Flowers', in the way he treated the delicacy of baby's-breath, which was sprayed across hard-edged suiting as some of the designer's most aggressive florals to date. This stark outing was stripped of all colour, and applied that robust, tailored silhouette that Tisci has taken from the street, tailored, and made his own. Despite the explicit reflections of season's past, the conceit here was a sensual dialogue with femininity - ladylike tropes that appeared as sheer organza layering over bomber jackets, tanks and tees, and a finale of white pearls encrusted on black satin.